Walnut is a remarkable option when it comes to making traditional-style furniture. However, this wood is also being used to create more fascinating and modern designs. As a durable hardwood, walnut is maintains a stunning finish for years. Additionally, the wood has been a major component of some of the most quintessential furniture designs in history. For generations, both furniture and interior designers view this wood as a favorite material largely because of it beauty and durability. Walnut trees lose their leaves during the fall and winter seasons, which is an indication that it is a deciduous hardwood. Included among walnut trees are any of the classes from the Juglans genus of plants. However, Juglas regia or English walnut and Juglans nigra or black walnut are the most popular varieties used to make walnut wood furniture. When the wood is cut, the grain is straight but the grain becomes wavy the closer to the roots you get. There can be a dramatic variation in the color of walnut. It can range very light brown to very dark brown. The darker wood is produced in the middle of the walnut tree and the lighter wood is produced in the outer layers of the tree, right underneath the bark. This wood is a hard, strong and durable and it carves well and holds its shape for many years. As such, it is an exceptional option for ornate furniture pieces, such as a headboard or mantelpiece, on which intricate woodworking are usually done in traditional furniture making. 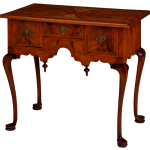 In 17th and 18th Century Europe, walnut was used regularly to make pieces of furniture like cabinets due to its inherent qualities. When it comes to contemporary furniture making, the elevated price of walnut has resulted in the popular use of walnut veneers over solid walnut. When purchasing new or used pieces of walnut furniture, you should look for wood that has a straight grain; a clear coat of urethane should be used to accentuate the grain of the wood. As it relates to finish, this is just a matter of taste but you should be mindful that any stain on the furniture could make the gorgeous grain less obvious. Additionally, older pieces are likely made from solid walnut, while more modern pieces are more likely made out of walnut veneer. With the proper care and maintenance, walnut wood furniture can very easily last a lifetime. A number of experts have observed the wood and concluded that its durability is the number one reason it has maintained its popularity within the furniture making industry all over the world. A bedhead is one of the most defining details in a well-groomed bedroom; a unique feature that adds glamour, amps up the comfort factor, act as a great sound baffle and even provides clever extra storage to boot. There are many bedhead styles in the market—velvet, upholstery, timber and leather among others. Upholstery bedheads are some of the most striking and visually appealing, a feature that has made them quite popular with Sydney shoppers. Many people make the mistake of downplaying the role of a bedhead as an accessory. It’s best to view a bedhead as a whole new piece of furniture that you are adding to your room. Go for something that brings various pieces together and blends harmoniously in your space. An upholstered wall panel or nook can create a focal point in the room by anchoring the bed and furniture making it a great option for rooms with industrial finishes or tall ceilings. A large bedhead, on the other hand, helps create a fashion statement in large rooms while light options such as wall mounted floating panels provide a sense of height and extra space in a smaller room. Custom made or off the rack? You can get a custom made solution that’s either a retro fit or the look without bed frame. Floor standing options suit renters better while homeowners can choose from a variety of wall-mounted options. There are some great off the rack options too though many come as part of the whole bed frame. Talk with your upholsterer about your preferred texture and color. You can take your cues from your favorite bed linen—think Persian carpets, Kantha quilts and Kilims for feature statements. Leather bedheads are also popular though more natural finishes including light tans tend to discolor with time. Low-end upholstered bedheads in Sydney start from $150 making them affordable for seasonal updates. Higher quality bargains start around $245. Mid-range bedheads provide a wider choice in color, durability, fabric quality and fun design details. These fall in the $599-999 range. A high-end custom solution can knock you off $2,000. A little known fact is that upholstered bedheads allow for more comfort than typical bed frames. They also create eye-alluring focal points in rooms with minimal effort. However, settling on a suitable bedhead design can be a bit tricky. Talking to a seasoned upholsterer can help before making a decision. 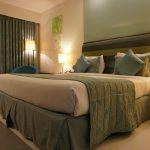 Hopefully, the above tips will help you find some of the best upholstered bedheads Sydney gas to offer. If you want to add a new range of furniture in your home, there are a lot of options to choose from. Traditionally, many homeowners have opted for conventional styles such as leather sofas or Formica countertops. However, in the recent past, out-of-the box materials have started making a comeback. Once associated with outdoor hardscaping (retaining walls and driveways), concrete is now used for home furniture. So, why should you opt for a concrete stool? 1. Sustainability and Beauty: stools made from concrete come in a myriad colors, which is a big asset to any setting. The unique craftsmanship that goes into manufacturing of these types of stools will never be outdated. What’s more, concrete furniture also combines perfectly with other designer furniture and overall outdoor decors. A few upholstered outdoor pieces, for instance, will blend nicely with the regal look of a concrete stool. 2. Durability: a concrete stool can withstand a lot of punishments—fire, water, insects, decay and more. It will also handle well any form of wear and tear. Put simply, a concrete stool will dress up your backyard for eons, especially when properly taken care of. 3. 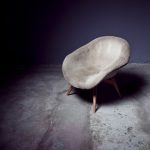 Low Cost: As a material, concrete is quite affordable, especially when compared to other material options, especially those used to make designer furniture. Concrete stools are also easy to maintain. By simply keeping it clean, it will maintain its natural beauty for several years. Additionally, the ability to recycle a stool made of concrete at some point in time is significant to the environment. 4. Natural look: Considering that it is a stone-based and natural material, concrete stool meshes well with other natural elements such as leather, wood, or metal. Many homeowners consider it as the easiest way to create your own landscape inside your home. 5. Versatile Texture and Finish options: Because it can be molded, concrete stools can be textured to stimulate wood grain or just about any texture you can think about. It can also be given a wide range of unique finishes. You can create any size, shape, or design of mold that you deem appropriate and turn your creations into reality. 6. Adaptability: homeowners working with tight spaces have found concrete stools to be very useful as they can be customized to fit in any existing space. By and large, the look of a decorative concrete stool is spectacular, and a few furniture pieces can turn a drab looking space into a rich and regal showplace that can serve as a gathering place for your friends and family. For versatile functionality and beauty, you should consider installing a concrete stool. School furniture plays a crucial role in classrooms by encouraging students to learn. However, identifying the ideal classroom furniture is undoubtedly a tricky chore. First, you have to consider the budget at hand. You need not invest in the newest furniture for schools. Below is some useful information regarding School Furniture Suppliers Canada services. 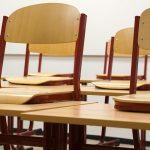 It is not hard to obtain discounts while investing in school furniture. Most times, schools buy in bulk and all it calls for is for the procurement sector to check out various stores for the offers. Note that online sales are always cheaper. Again, you need not worry about delivery, as shipping has made online trades simple. Other factors that might lure you to shop online are convenience and saving of time. The web also has a wider variety and you get a clear picture of the furniture that is on sale. Durability is of the essence. You do not want to endanger kids due to poor quality pieces. In addition, you want to save the institution the financial agony of making another purchase any time soon. Most importantly, the furniture should be well finished. Scratchy edges can cause minor injuries and discomfort to the kids. Also, make sure you get the features of the furniture right. The kind that would be used for teenagers would not match that of kindergarten pupils. The height, space and diameter have to be observed. Another vital consideration before approaching the suppliers is the style and decoration of the classroom. Go for attractively bright colors for elementary classrooms. Let the theme match with the decorations, to make the ambient more pleasant and accommodating. For older students, you can settle for homogeneous decorations to achieve a clean, neat and focused ambient. Another consideration is the size of the classroom. You also need to understand the activities that will be taking place in the area before making a decision. It is wise to use one supplier. Given the special relationship you create, you might benefit from better prices. Nevertheless, do not be over reluctant in gathering information on the current market rates. You might identify a better option in future. Ensure that the school furniture you purchase meets the safety requirements in Canada. The most important factor is ensuring that the furniture is ergonomic to evade health issues for those using it. You can acquire School Furniture Suppliers Canada offers that fit your budget. For those with a flexible budget, you can consider customized furniture, to make it more interesting.